Yamaha's version of the Pronto updates ergonomics and the user interface, but leaves power intact. 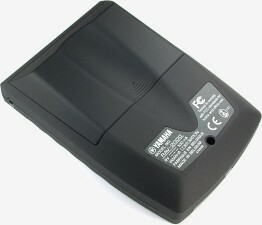 When Yamaha first announced the RAV-2000, it was naturally assumed that the company had developed a brand new remote control to compete directly with the reigning LCD king, the Philips Pronto. Much to everyone's surprise, as more details were gathered it became obvious that the RAV-2000 wasn't actually a Pronto clone, but rather a genuine Pronto dressed up in Yamaha clothes. But why would this be? 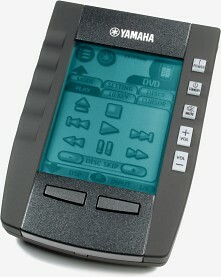 Upon further consideration, it makes sense that Yamaha would go to Philips for their own touchscreen remote. As has been demonstrated by many other companies intent on creating their own graphical offerings, it's extremely hard to dethrone the Pronto from the very market segment it helped create. So, as the old saying goes, "if you can't beat 'em, join 'em". Now, re-branding the Pronto under another company's name isn't exactly new for Philips. Marantz has been selling their version of the remote as the RC5000 (more recently the RC5000i) almost since the Pronto first appeared, but at that time Marantz was also a part of the Philips family. The RAV-2000 marks a departure for Philips in more ways than one: not only is this the first time they've placed the Pronto in new housing, but it's also the first time it's been sold under the crest of a non-familial brand. Could older really be better? While the original Pronto's case looks like someone had slowly and carefully formed it out of foam (smooth, curvy and comfortable), at first glance the RAV-2000 appears to have been created on a computer screen by someone with a penchant for straight lines. The physical dimensions do remain nearly identical to the Pronto at 3.6" by 5.3" by 1.6" (9.2cm by 13.5cm by 4.0cm) - that's only 0.1" wider, 0.1" thicker and no heavier at 9.5oz with batteries - but the RAV-2000 still feels like a much larger remote. With a masculine, angular appearance, the RAV-2000 is most certainly good looking on a tabletop. In fact, Yamaha has kicked up the styling a notch with charcoal gray matte plastic finished complemented by smooth automotive-like metallic black painted plastic inserts, plus what have to be the best designed volume hard buttons I've seen on one of these remotes. Even though this is obviously a handheld remote, the RAV-2000 designers seem to have been attempting to produce a tabletop remote, since its shape is not as ergonomic as it could have been. While the RAV-2000's thickness decreases along the length of the remote just like the Pronto, the Pronto remains measurably thinner overall. The Pronto also tapers inwards to 3.2" (8.1cm) wide at the bottom of the screen, while at the same point the RAV-2000 still measures 3.5" (8.9cm). The Pronto's largely concave back sits comfortably on a leg and aids in a secure grip, while the RAV-2000's new design only incorporates a small (yet still functional) finger groove, the rest remaining completely flat. Speaking of fingers, the RAV-2000's unusual matte texturing collects prints and smudges awfully well - it was difficult to keep my remote looking new and clean while photographing.